Mexico City – A military helicopter carrying officials who were assessing damage from a powerful earthquake flipped as it was attempting to land in southern Mexico, crashing on top of people who had fled their homes and were spending the night outside. Thirteen people were killed – the only known fatalities related to the quake – and 16 were injured. No one aboard the helicopter, including Interior Secretary Alfonso Navarrete and Oaxaca Gov. Alejandro Murat, was seriously hurt. Jorge Morales, a local reporter who was aboard the helicopter when it crashed on Friday night, described harrowing moments as the pilot lost control and the helicopter attempted to touch down in a swirl of dust in Jamiltepec, a city in Oaxaca state close to the epicentre of the earthquake that struck earlier on Friday. "The moment the helicopter touched down it lost control, it slid – like it skidded – and it hit some vehicles that were parked alongside the area that had been defined for the landing," Morales told a Mexican television news program. Navarrete told local media that "as the army helicopter we were travelling in tried to land, the pilot lost control, the helicopter fell and flipped". A state government official, who was not authorised to be quoted by name, said the chopper crashed into a group of people who had been spending the night outside after the 7.2 magnitude earthquake hit the area. Aftershocks, including one of 5.8 magnitude that struck about an hour after the first, had caused people to flee their homes for fear they would collapse. 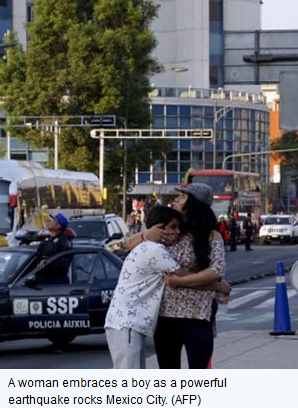 The Oaxaca state prosecutor's office said in a statement that five women, four men and three children were killed at the crash site and another person died later at a hospital. The defence department said the Blackhawk helicopter crashed as it was preparing to land in a vacant lot. The department said the victims had been waiting for the helicopter, but did not provide more details. Navarrete and the defence department said they regretted the loss of life. The quake damaged about 50 homes in Jamiltepec, as well as the town hall and church, according to the Interior Department. It also rocked buildings in Mexico City, and many other parts of the country. But the damage was minimal compared to a massive 8.2 quake that struck in the same general area on September 7, and a 7.1 magnitude quake on September 19, which killed a total of 471 people between the two of them and damaged over 180 000 houses in eight states, including Mexico City. The US Geological Survey said Friday's quake was centred 53km northeast of Pinotepa in southern Oaxaca state and had a depth of 24km. Two people suffered fractures caused by the quake and were treated in Pinotepa Nacional. Their lives were not in danger. Navarrete has led the Interior Department, which oversees most political and security issues, for little over a month. Earlier this month, an intelligence agent from an agency overseen by Navarrete's department was caught tailing an opposition presidential candidate.